From the beginning to the end Nelson Mandela kept dancing. Now he dances along "Glory" road. Struggle...battles can be fought at many levels. Each level of struggle is important to the psyche of a "warrior." A warrior may not be the traditional combatant. He or she may engage the enemy in other meaningful ways. I grew up in an America in transition. It was in transition because the African-American youth of my generation could not remain complacent while our own country, not only treated us like second class citizens but watched while we were beaten in the streets, bitten by dogs and worst. We learned early about the power of hate. Emmett Till, a fourteen year old boy was hanged for supposedly flirting with an equally young white girl. We understood the resistance we were up against when Medgar Evers, a fiery young voice for Civil Rights, was shot to death at his his home. It did not stop happening, the controversial and powerful messenger for justice, Malcolm X was also assassinated. Curiously, racially motivated detractors did not make a distinctions between the voice which was rooted in peace and that which hinted at retaliation. All African-American warriors were marked, simply because they choose to take a public stand. Death was arising out of righteous demands and the flames,perhaps ignited out of my blood link to Nat Turner, called me to be defiant also. I started a Martial path early in life. I had taken to calling my practice "The Art of Dancing to "No-Music." The spiritual significance of that choice became clear the moment I saw Nelson Mandela leaving prison after 27 years. By the time I saw the live news broadcast of Nelson Mandela's release from Robben Island, the prison, most of us involved in the struggle for freedom on the local and national level had become keenly aware of the plight of Black South Africans. We learned of Apartheid We had our own struggles, our own problems but somehow our hearts expanded. We embraced our South African brothers and sisters...and then something unexpected happened. We discovered Nelson Mandela, a hero of mythic proportions.The day I saw him leaving the prison grounds I saw something powerful and unforgettable. I saw him leave dancing with his people. His smile was telling and his steps were lively. There was no hint of bitterness. It occurred to me then, and even now, that there was power in his dance to "No-Music." It connected him to love, to the faith of his people. I imagined that he had also danced in his cell,and the rhythm of that dance counter-acted the years. From the first to almost the last, Nelson Mandela danced to "No-Music" and in so doing found the universal rhythm. By "No-Music" I refer to following The Spirit. Nelson Mandela loved soccer, as well as dancing. The people loved him. This video fashioned out of youthful enthusiasm, was introduced last year. It reflects the soul of Nelson Mandela... and his heart. Considering the destructive power of Apartheid and the unyielding racism of most Afrikaner, one would naturally expect Nelson Mandela to harbor some plans of revenge as he rose to power. However, Mandela became president and not a single head rolled, literally or figuratively. He offered forgiveness and reconciliation. He presented an image of a South Africa that embraced all as one. He did not paint this beautiful picture in words. He opened his arms and set the example. Nelson Mandela did not slay the "beast" and revel in its blood, as so many strongmen had done before him. Mandela tamed the beast, and the once wild devour of Black African esteem became an ally. There is a special power in dancing in rhythm. You are not alone. You can not be alone as you do so. Truly, the universe moves in harmony with you, helping you fulfill your mission. While I marvel at the fact, I am at the same time grateful that Nelson Mandela lived to be 95 years old. After 27 years in prison he lived to achieve international impact and became president of a nation. The other fact worth noting is that he was not assassinated. He was the director of major change, yet he enjoyed peace until the end. The Wind of The Divine was a work here. It would seem that what Nelson Mandela accomplished in his country was impossible. Obviously, it was not. He gave himself to the task. The presidency of President Obama would also seem impossible but he ran like he could win. We learn from Nelson Mandela that we should carry ourselves like we belong, and to believe in the value of what we say or do. Nelson Mandela shook the world with the power of his dance steps, and the and he were infectious. He touched many people in his life and some of us were blessed to share vibes with him in passing. 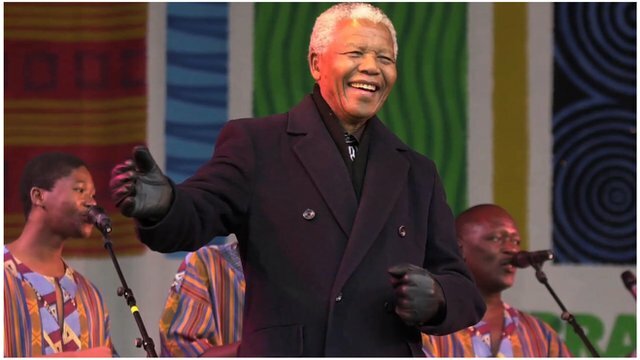 When I was named a consultant to the international research facility, The Meikle Files, based in Australia, I had no idea that Nelson Mandela was also on board. I found it fitting but amusing to find his name on a list with mine. Then again, I believe in impossibilities. I rejoiced in Mandela's many triumphs, the triumph of his spirit. At the beginning of this piece I spoke of how connected Nelson Mandela was to his people through dance. The following video which includes him, is a labor of love by South African youth. It underscores my point but I also think it will touch your heart. Watching it, I feel like dancing. Like my South African brothers and sisters I will dance with him on his journey home. The journey is for each of us to take one day. May we not have to take it alone. May we be accompanies by the spirit of ourloved ones, and ancestors who have gone on before. Mandela was a man for all people. He rightfully belonged to the world. His secret was loving and being lovable.